San Jose’s evolution from a burger-and-fries town to a city with an acquired taste for tartufi bianchi didn’t just happen. As in any cultural revolution, someone or something had to lead it in that direction. Paolo’s has admirably filled that role in San Jose. Certainly, numerous other fine restaurants have opened in recent years, but none have defined that great Italian dinner for generation after generation as well as the one launched by Giacchino Paolo Aiello, better known as Jack Allen, and his wife, Geraldine. Only a scant few have that indefinable quality the Italians call il cuore — heart — exemplified by Paolo’s. Paolo’s celebrated its 50th anniversary in 2008 — an incredible milestone in an industry as competitive as the restaurant business. The anniversary calls to mind the memories of people and events that shaped what Paolo’s is today. We begin with the arrival of grandfather Carlo Aiello in New York City in the bustling late 1800s. Masses of immigrants had landed on Ellis Island and found their way to the different ethnic neighborhoods defining New York City. It was a time filled with strong characters. Tammany Hall was in full swing. Teddy Roosevelt began a campaign to clean up corruption and crime. 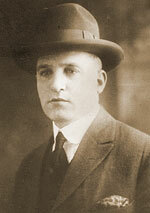 As his son, Giacchino Paolo Aiello (later Americanized to Jack Allen) grew older, Carlo sent the boy to deliver bread to restaurants scattered throughout the city. It was in the kitchens and dining rooms of these restaurants that Giacchino became captivated by the restaurant business. He admired and learned from New York’s finest chefs and restaurant owners. Sometimes, the chefs would gather at the Aiello home drinking and playing poker with his father, Carlo, and cooking late into the night. Giacchino was fascinated by their creativity and energy. He watched and lent a hand in the kitchen as they prepared impromptu meals. 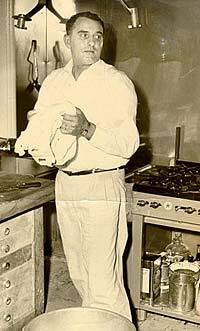 But his love affair with cooking, especially the cuisine of his homeland, began at an even earlier age. His father and his mother, Rosaria, who were both fantastic Italian home cooks, tremendously influenced him as a young child. They would remain his culinary touchstones throughout his life. As war broke out in Europe and the Atlantic blockade took effect, the supply of canned tomatoes from Italy slowed to a trickle. In 1914, the Aiello family set out to fill the void by starting one of the first American tomato canning companies, Aiello Brothers, with the brand name Contadina near Highland, New York. The long and hot growing season afforded by Santa Clara Valley summers became the catalyst for moving Contadina and the Aiello family to the West Coast in 1917. But the family did not sell their farm near Highland, N.Y., choosing instead to divide up their time between the East and West Coasts and crisscrossing the United States by train 50-plus times in the process. Carlo would reserve several cars for the multitude of family and friends in tow and always entertained lavishly en route. During his time in San Jose, Giacchino attended St. Joseph’s parochial school and high school at Bellarmine College Preparatory. He helped run the family cannery both before and after his father died, and Contadina was sold in the early 1930s. But Giacchino continued to be intrigued by cooking and the restaurant business. Giacchino returned to New Paltz, N.Y., to earn a double degree in History and English and his teaching credential. In his first teaching assignment, his students had such trouble pronouncing his name that he changed it from Giacchino Paolo Aiello to John (Jack) Paul Allen. 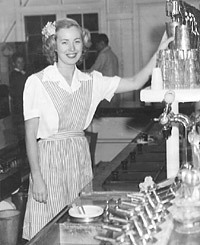 Jack frequented a Burbank-district coffee shop on San Carlos Street, where he met the owner’s daughter, Geraldine Adrian. Although 14 years younger than Jack, Geraldine was drawn to this tall, dark and handsome man with self-assured worldliness, wit and a charismatic, generous personality. Jack recognized and valued Geraldine’s intelligence and business sense and thought she was a real dish! At this time, a popular local drive-in chain, The Holland Creamery, was operating in San Jose. Unfortunately for the Holland Creameries, World War II’s rationing caused severe problems with their supply of products. In 1943, the general manager of Meadow Gold Corporation offered Jack and his brother, Peter, three restaurants for purchase. With the hard work of Geraldine Adrian and her mother, Eleanor, and Jack’s connections in the wholesale and import markets as well as his natural flair for cooking, they were soon able to resurrect the creameries. One of the restaurants burned down in the early 1940s; Jack’s brother Peter kept and ran one, leaving Jack with the Holland Creamery at 12th and Santa Clara streets. At war’s end, the Creamery drew lines of cars several blocks long down Santa Clara Street waiting to have carhop service of hamburgers and milkshakes. Jack married Geraldine in the early 1950s. He slowly introduced pizza, as well as some of the dishes he had learned from his parents and the chefs of New York City, and some he improvised. Soon he was getting an equal number of requests for his home-cooked Italian food and the standard American fare; and he changed the name to Shaky Jakie’s Pizza. More and more, people asked Jack to cook up one of the dishes from his native country. Hamburgers and milkshakes took a back seat to the regional Italian and continental cuisine Jack was preparing. In 1958, Jack made a decision to change Shaky Jakie’s Pizza into a fine Italian/Continental restaurant. Naming it Paolo’s, after his middle name, the restaurant became a San Jose institution recognized nationally for its excellent cuisine and wines. Paolo’s 1961 menu featured everything from Chicken Jerusalem Flambe to Gnocchi Napoletani... to Frog Legs alla Livornese. Some dishes, such as the Scampi (Gamberi) alla Livornese and Saltimboca, continue to be a mainstay of our menu some 44 years later. Prices and menu selections have changed a bit over the years. The 1961 menu offers a “Complete Luncheon, Served Daily” from $1.50, a lobster dinner for $3.50, house made ravioli for $1.95 and the antipasto plate ordered with your entree for an additional 85 cents. Featured desserts included Crepes Suzette, Strawberries Romanoff, Baked Alaska and Cheesecake. While Jack Allen cooked up new ideas and created the personae for the restaurant, Geraldine Allen served as the pragmatic business anchor. Paolo’s was the first restaurant to bring oysters, Icelandic scampi and Belgian endive to this area and present them among other dishes in a way that won both local and national acclaim. But Paolo’s never had to “adopt” the recent trend of buying produce or products from local farmers and specialized suppliers. Jack always cultivated and cherished his long-standing relationships with such local individuals and businesses. The restaurant became renowned for its creative but straightforward use of local ingredients long before the practice became fashionable. Paolo’s menu continued to evolve over time with the emphasis shifting away from mainstream continental fare towards traditional regional Italian cuisine and Jack’s unique Italian inspired creations. Paolo’s drew regional and national attention. Joe DiMaggio, a friend of Jack’s since the early 1950s, was always dropping by for lunch and an afternoon game of golf. A young Barbra Streisand came down for dinner with radio talk show host Les Crane and talked late into the night with the always entertaining Jack Allen. A range of celebrities and political leaders dined at Paolo’s, including Eleanor Roosevelt, Debbie Reynolds, Jim Brown, Robert Goulet, Governor Pat Brown, Senator Edmund Muskie, Henry Mancini and Jack La Lane, to name just a few. The notoriety of the restaurant continued to grow into the 1970s when Jack Allen hosted community fundraisers with the Hollywood All Stars Team playing baseball games and celebrating at Paolo’s afterwards until the wee hours. A bevy of television stars, including Dr. Kildare and Batgirl, joined in on this effort. In the late 1970s, Geraldine Allen was diagnosed with cancer. Daughters Jenny and Carolyn helped manage the restaurant and baby-sit their 14-year-old brother, John, in between their college schedules. It was a difficult time for the entire family, but they managed to keep Paolo’s running with continued excellence. The restaurant continued into the 1980s at 12th and Santa Clara streets, with daughters Carolyn and Jenny running the show. Jack had formally retired but remained a constant presence, especially in the dining room. Jenny spent most of her time greeting guests and getting to know Paolo’s clientele, Carolyn spent most of her energies in the office, familiarizing herself with the financial end of the business, but especially loved her time in the kitchen, where she devoted herself to maintaining her father’s signature dishes while gradually adding menu items which reflected her own taste and style. Jack and Carolyn’s collaborative menu and the warm and attentive dining room service coordinated by Jenny continued to bring awards year after year. 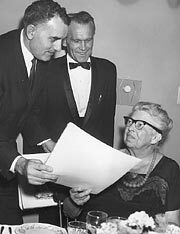 As the restaurant matured, Jack’s menu contributions were the established and familiar favorites of the old-time clientele, while Carolyn infused the menu with ideas and inspirations from her continued travels that appealed to patrons eager to taste regional Italian specialties not previously introduced on U.S. shores. 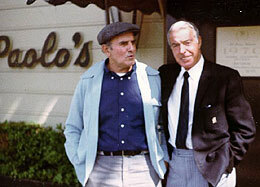 Besides the regular drop-ins by Joe DiMaggio, some of the celebrities that visited Paolo’s in the 1980s and 1990s were Eddie Murphy, Bill Murray, Andy Rooney, Bill Walsh, Joe Montana, Brent Jones, Anthony Quinn, Robert Goulet and Governor Jerry Brown. Many of Silicon Valley’s legendary business deals were struck in the restaurant’s intimate wine cellar. Paolo’s was one of only 50 restaurants invited to serve at the 1985 Presidential Inaugural in the Taste of America, Washington, D.C.
Photo by Tom Van Dyke. © San Jose Mercury News. And the town, times and people changed in the 1980s and 1990s. 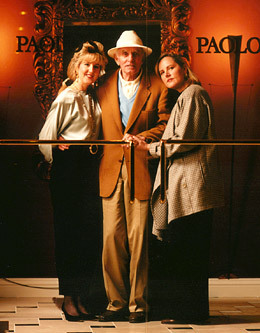 Carolyn and Jenny Allen, who had bucked tradition to become pioneers in a once male-dominated business, ensured Paolo’s set the pace. In December 1991, the Allen daughters moved the landmark restaurant from its former location on Santa Clara Street to the new and invigorating downtown San Jose RiverPark site on the shores of the Guadalupe River. The setting, though still elegant and dramatic, is more relaxed, and, in addition to fine dining, Paolo’s clientele can choose to enjoy a range of entertaining possibilities, including gorgeous private dining rooms for every type of event, from intimate weddings and celebratory gatherings to corporate entertaining, off-premise catering and a bar with occasional live music, after-theater service and an extensive selection of quality wines, grappa, ports, cognacs and single malt-scotch. Although Jenny Allen left the restaurant business in 1994, through the continued culinary leadership of Carolyn Allen, Paolo’s menu continues to evolve and delight an ever-more sophisticated clientele. Jalil Samavarchian, Carolyn’s husband and Paolo’s maître d’/sommelier, has created a wine list of exceptional depth and breadth and developed a uniquely personal rapport with Paolo’s clientele.